The case of Baby Veronica has garnered much attention this year. NICWA has been following this case closely, carefully reviewing court proceedings, monitoring media coverage, and consulting with partner organizations and others regarding potential legal implications. NICWA remains committed helping the public understand the complexities of the Indian Child Welfare Act and its application today. Therefore, we have compiled the following information and resources regarding the Baby Veronica case. The case involves a Cherokee Nation father and a non-Indian mother who at one time were engaged and living in Oklahoma. Veronica’s father was on active military duty at Fort Sill, Oklahoma, when the mother broke off their engagement while pregnant with Veronica. The father and his family attempted to contact the mother during the pregnancy, but the mother cut off communication a few months before the birth of Veronica. A few months before Veronica’s birth, her mother began working with an adoption attorney in Oklahoma to adopt the child out to a non-Indian family from South Carolina, the Capobiancos. The father was not informed of these plans until four months after Veronica’s birth and subsequent placement with the Capobiancos. 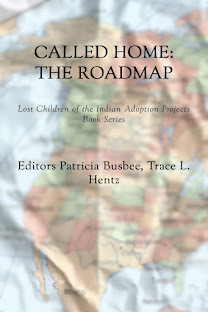 Oklahoma state law required notice be provided to the child’s tribe, the Cherokee Nation, but the notice provided by the adoption attorney was not complete and not properly executed. It included a misspelling of the father’s name and the wrong birth date. This delayed the tribe’s ability to certify that Veronica was eligible for tribal membership and become involved until months after Veronica was moved to South Carolina. Additional paperwork required under the Interstate Compact on the Placement of Children, giving authority to the Capobiancos to relocate Veronica to South Carolina, only identified Veronica as Hispanic even though it was known that she had Indian ancestry. When the child was four months old, Veronica’s father was served with notice of the Capobiancos’ intent to adopt. He was served in a parking lot outside the army base without counsel present just days from his deployment to Iraq. The father signed the paperwork under the impression that he was relinquishing his parental rights to the birth mother, but recognized soon after that it was asking for him to relinquish his parental rights for placement with the South Carolina couple. The father asked for the paperwork to be returned to him and was denied by the server. Immediately, he contacted the JAG attorney at the military base and began the process of challenging the proposed adoption. He was deployed to Iraq seven days after filing a stay of the adoption proceeding, where he served his country well and was awarded a Bronze Star. The South Carolina district court denied the South Carolina couple’s petition to adopt and ordered transfer of custody to her father. The South Carolina couple appealed, but the ruling was upheld by a lower appellate court in South Carolina. Veronica’s father assumed custody of his daughter on December 31, 2011, in a highly publicized handing over of Veronica. The Capobiancos then appealed to the South Carolina Supreme Court, which upheld the lower court’s decision. In the state Supreme Court decision, the court said that there was no evidence that Veronica was not presently in a safe and loving home with her birth father. The Capobiancos have now indicated that they will be applying for review by the U.S. Supreme Court. The extensive media coverage of the Baby Veronica Case has included many inaccuracies. Here, NICWA fact checks some of these recurring assertions. Anderson Cooper: The biological father did waive his rights, apparently, early on, and then two weeks later changed his mind. Father was not made aware of the Mother’s intent to adopt out Veronica until four months after her birth. Father signed an “Acceptance of Service and Answer of Defendant” which was not a lawful “waiver” of his rights. After signing, Father realized that the paper did not relinquish his rights to the mother but instead to potential adoptive parents and immediately attempted to retrieve it. Father sought the advice of a JAG attorney. Five days later, he requested a stay of the adoption. Eight days later he filed official documentation to establish paternity, child custody, and support of Veronica. The state of South Carolina finalized the adoption and terminated Brown's rights as a father for lack of action on his daughter's behalf. Brown waived his right to contest the adoption. 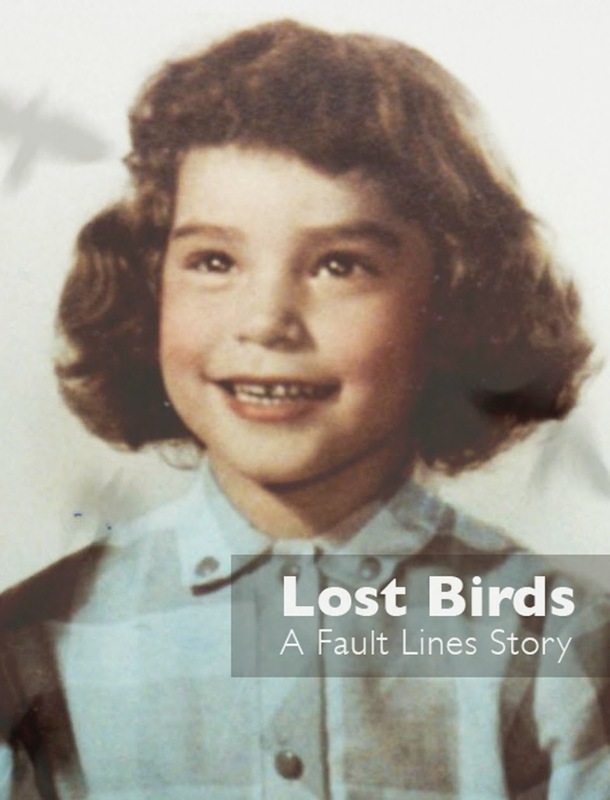 At that time, Veronica, then an infant, legally became the daughter of the Capobiancos. (Huffington Post, August 23, 2012) The adoption was never finalized. 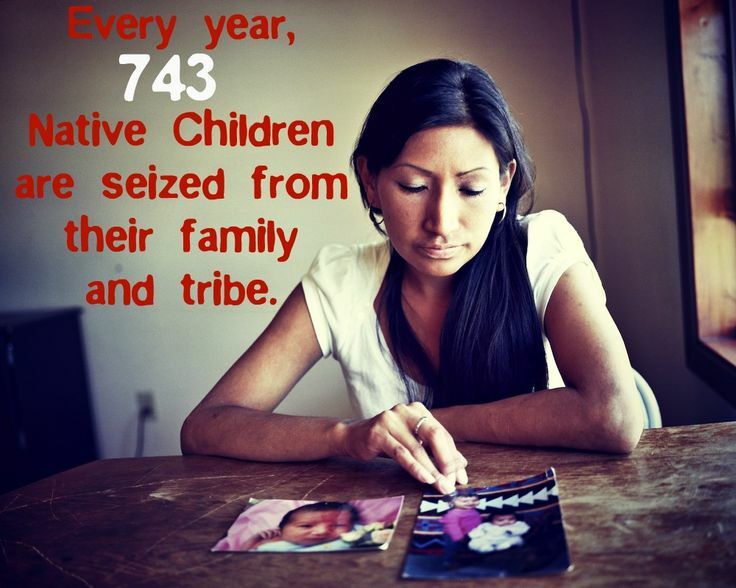 Summer 2012 Case highlights failure to follow ICWA dictates by Joe Kroll, executive director of the North American Council on Adoptable Children, Adoptalk. 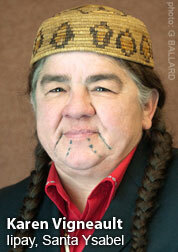 August 23, 2012 Doing what's best for the tribe by Marcia Zug, Slate.com. 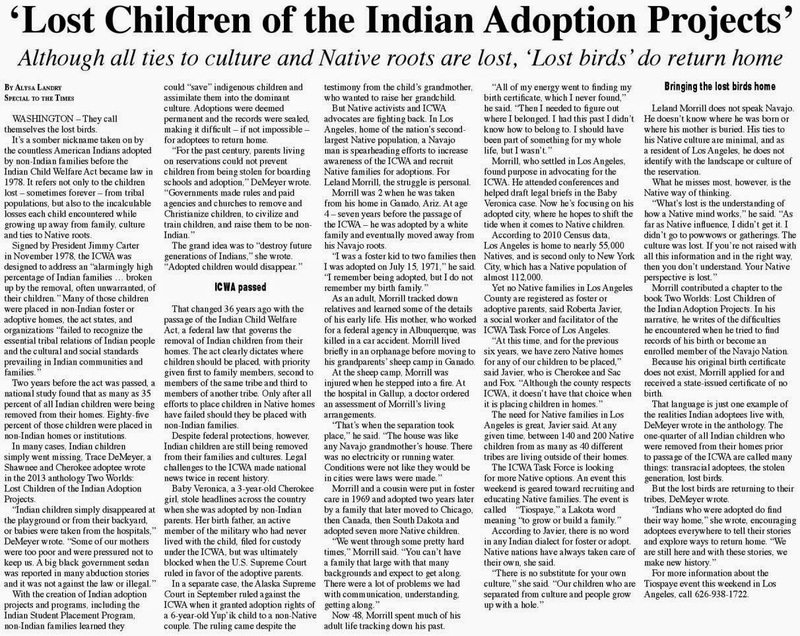 July 20, 2012 Full compliance with Indian Child Welfare Act, not its dismantling, is needed Op-ed by Terry Cross, NICWA executive director, The Oklahoman. Thank you for blogging about this.